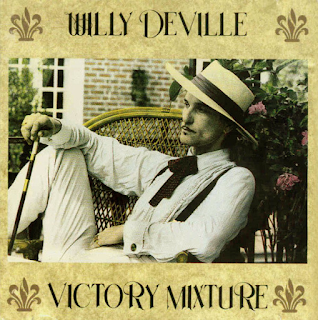 After the success of the impressive "Miracle", from 1987, Wily De Ville returned in 1990 for his second solo album. 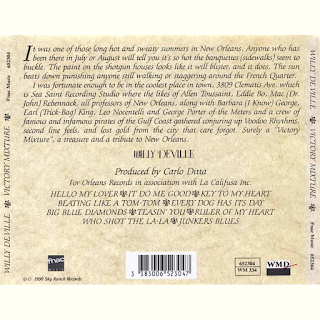 In this he covered songs from his beloved New Orleans R'n'B artists. It was something of a labour of love. Apparently the material was recorded with minimal modern technology, thus giving them an authenticity. Modern studios, have, however, meant that the sound is full and punchy. It also helped that among the musicians playing on the album is Dr. John, Eddie Bo, Allen Toussaint and various members of 70s/80s funk band The Meters. The backing is of the highest quality throughout. The opener, "Hello My Lover" has horns, rocking piano and De Ville's instantly recognisable voice making us feel we are in good hands for this journey to the hot, steamy crescent city. 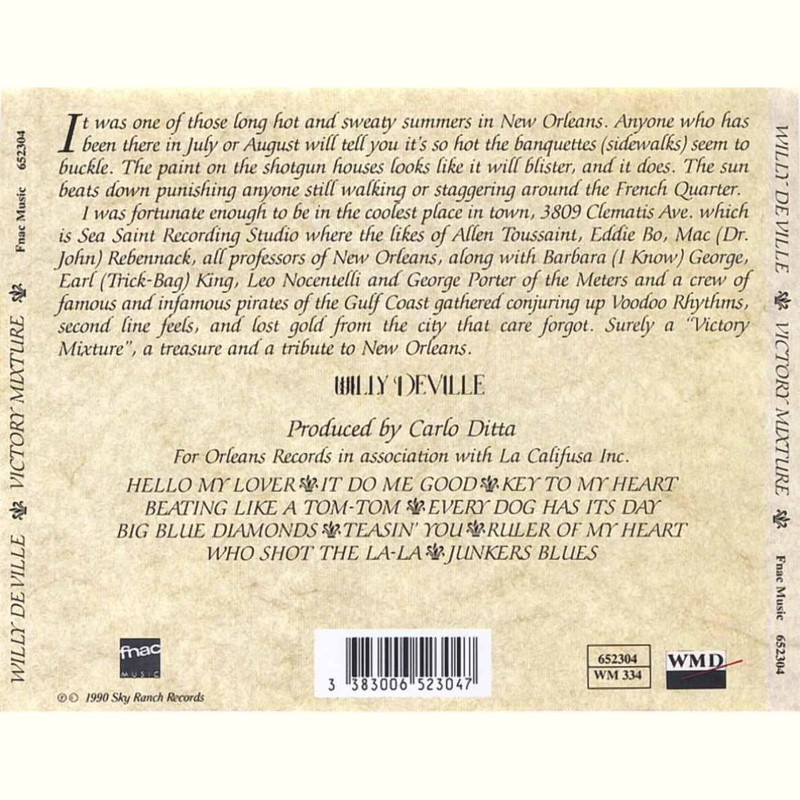 "It Do Me Good" is a bass-heavy, full-on blues rocker, while "Key To My Heart" has a fifties rock'n'roll doo-wop ballad feel to it, with De Ville's voice in full "yesterday, today, tomorrow" mode (as Doc Pomus once said of it). Very few singers could handle a slow number as wonderfully as De Ville with those yearning, nasal tones. My goodness, I miss him. The organ swirls in at the end and Willy takes us to heaven. "Beating Like A Tom-Tom" sees his voice on great fifties soul form again and the backing is full, rich but pleasantly sparse too, if you get my drift. It sounds like a late fifties song recorded under slightly better conditions. This is New Orleans blues influenced rock'n'roll of the highest order. "Every Dog Has Its Day" is a lively, rhythmic groove with an early Motown-influenced horn section and a stunning saxophone solo over a syncopated, heady "Money"-style drumbeat. I had overlooked this album in favour of most of Willy's other material. God knows why. It's fantastic. "Big Blue Diamonds" is proper New Orleans-influenced blues, with that insistent slow rock'n'roll piano underpinning everything. "Teasin' You" is a slice of Cajun-style, upbeat fun with a few hints of The Temptations' "The Way You Do The Things You Do". "Ruler Of My Heart" is a jazzy, sparsely-backed soulful number with De Ville once again on top vocal form. "Who Shot The La-La" would not have sounded out of place on Southside Johnny's first album, in that whisky-soaked grizzly blues voice way. "Junkers Blues" is a bona fide, chugging blues closer with De Ville sounding eighty years old and black. This really is an unjustly overlooked pearl of an album. As Steely Dan said of a girl from New Orleans - a "pearl of the quarter".